Welcome to JS readers! Feel free to browse my previous posts and recipes. For now, here’s the recipe that was in the paper, in case you’re looking for an electronic copy. Bun is probably one of my favorite summertime salads. If you don’t like beef, feel free to use shrimp, pork, tofu or chicken as the protein in this salad. Cook noodles according to package directions and chill in ice water under ready to use. Arrange a bed of lettuce on each plate. Top with chilled, drained noodles, carrots, cucumber, sliced beef, herbs and peanuts, if using. Drizzle nuoc cham over salad and serve extra along side. Tear basil and mint and combine with other ingredients. Add beef and marinade for at least 1 hour but no more than 3. Pat meat dry, then pan sear over medium-high heat or grill until desired doneness. Combine hot water and sugar to dissolve. Add other ingredients and adjust seasoning to your liking by adding more acid (lime), salt (fish sauce) or sugar. * Preferably 3 Crabs brand. Look for the pink label with 3 crabs on it. I – and many others – have never been able to replicate restaurant pho at home. No one’s sure why. 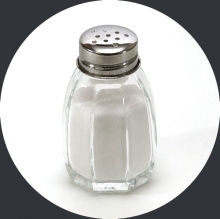 MSG? Stock that simmers for days? Who knows. That, coupled with the amount of time and money this recipe takes, makes me suggest that you only make this if you really, really like pho, and you really, really like cooking. This soup is really good, but not as good as you can get for $5 a bowl at your local Vietnamese place. This is expensive to make, unless you know a butcher you can get soup bones from for free, and yields relatively little. But it is good. 1. Make the stock. Put oxtail or soup bones into a large pot, cover with cold water, and bring to a boil for 10 minutes. While that’s boiling, roast your onions over the flame of your gas stove, or under the broiler until the skins turn black. Remove the skins. Roughly chop the onions and carrots and peel the ginger with a spoon. 2. After 10 minutes, drain the soup bones, rinse them, and clean out the pot. You’re getting rid of any scum here. Return the bones and add the other stock ingredients to the pot,except the fish sauce. Add 12 cups of water, and simmer for as long as you can stand it with the lid on, at least 3 hours. After that time, remove the lid and simmer another hour to reduce slightly. 3. When you just can’t stand it anymore and need to eat soon, remove the brisket from the pot, and strain everything into a clean pot through a mesh strainer with cheesecloth or a clean kitchen towel. Discard the solids. 4. Bring the soup to a simmer and add the fish sauce to taste. Cook rice noodles according to package directions. Slice the chiles and onion paper thin, and chop the herbs. Slice the sirloin as thin as humanly possible. The reason this is important is because the sirloin is cooked only once the hot broth hits it; otherwise it is never cooked. It helps to freeze the sirloin for 30 minutes or so before slicing. 5. 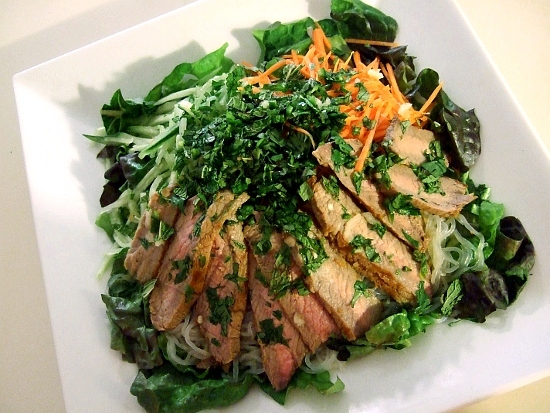 Assemble noodles in bowls and top with slices of the sirloin. Ladle the simmering broth over top and watch the meat cook! 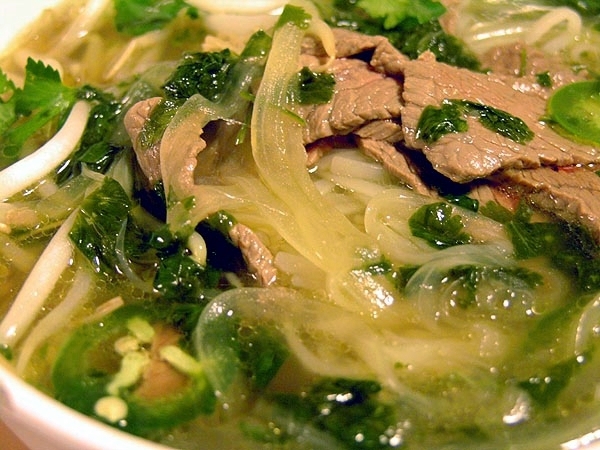 Top each bowl with herbs, lime juice, chiles, bean sprouts and onions to taste. Then drool.